Biochemistry, Neuroscience, and Physiology in theory and practice. | Coach Billy. Biochemistry, Neuroscience, and Physiology in theory and practice. 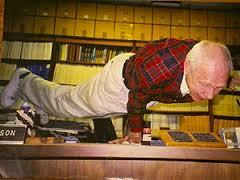 The Professor doing the One Arm Elbow Lever (OAEL) at age 74. Fred E. Samson (1918-2004) was a dedicated neuroscientist and a Professor of Biochemistry and Physiology at the University of Kansas-Lawrence Campus for 21 years. He spent another 29 years at the University of Kansas School of Medicine and became the Director of the Ralph Smith Mental Retardation and Human Development Research Center until 1989. He was recognized as Emeritus Professor of Molecular and Integrative Physiology until 2002. He was a very active scientist and he involved in conferences that brought together neuroscientist and scientists from many fields (mathematicians, physicists, chemists, etc) to focus on the basics of brain function. Amidst his busy schedule, he still found time every morning to swim across Lake Quivira and commit to physical training. He also enjoyed water-skiing until his early 80s. He is a person who definitely understood the capabilities of the human body and maximized it! What’s your excuse not to be fit? Bonus: another old guy performing the OAEL.